On the morning of 11 February 1963, The Beatles walked into EMI Studios in London. Ten hours later, their first album, Please Please Me, was finished, and music would never be the same. The group was already riding high on the strength of two singles they had previously recorded with producer George Martin (Love Me Do/P.S, I Love You and Please Please Me/From Me To You), but for their first LP, they would need ten more tracks to meet the UK standard of seven songs per side. And they would have to do it fast and cheap: The entire recording budget was £400 (just under $600), or what most bands spend on lunch these days. After seeing the band play to crazed fans at the Cavern Club in their hometown of Liverpool, Martin briefly considered recording the band live at the venue. But time restraints forced him to scrap the idea and he booked The Beatles for two sessions, morning and afternoon, at EMI. "It was a straightforward performance of their stage repertoire," said Martin of the sessions. "A broadcast, more or less." Within three years The Beatles (aided and abetted by Martin and engineer Geoff Emerick) would break every rule in the book with overdubs, backwards tracks, tape loops and other sonic firsts, but for Please Please Me, it was heads down and play. Martin was impressed by The Beatles' work ethic - they even rehearsed through their lunch break - so he added a nighttime session during which Lennon, sick with the flu and his voice ready to blow out, screamed his way through a cover of Twist And Shout. One take was all that was needed - and all Lennon could deliver - for their version to go down as a classic. "I don't know how they do it," said Martin. "We've been recording all day but the longer we go on the better they get." 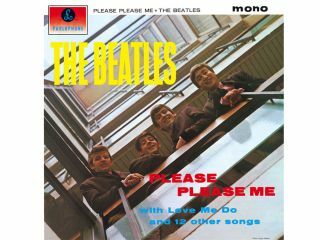 One additional song was captured during that night, Hold Me Tight, but as it would have made Please Please Me too long, it was tabled and re-recorded later that year for inclusion on the album With The Beatles. Even though they had two hit UK singles under their belts, The Beatles weren't seeing a lot of money yet. But they did make some bank for the Please Please Me sessions. Because they were members of the Musicians' Union, each Beatle received the standard seven pounds and ten shillings (£7.50) fee for each three-hour session. So already, they were well on their way to fame and fortune. It's more than a little remarkable to consider that, 46 years ago today, in all of 585 minutes (9 hours and 45 minutes), The Beatles blasted through a set of songs that would be the start of a worldwide cultural shift. And here's some additional perspective: it took Axl Rose 15 years and over $13 million to record Chinese Democracy.